People kept waving me off from this, which is like waving a red tablecloth at a bull (sorry, Mythbusters). This is, as the title implies, a sequel to the 1987 Rock ‘N’ Roll Nightmare, which is kind of a reluctant favorite of mine; it starts out as a rock band version of The Evil, veers into Ghoulies territory, then has a gonzo twist at the finale which is actually endearing in its desire to reach awesomeness, if lacking the resources to get there. Which is about the best way to describe Intercessor. It’s shot on video, has a comic book plot with comic book dialogue that uses fannish comic book art to advance the story – and that last bit is quite literal. The bad guys are Zompira and Mephisto, and there is some sort of plot involving a spindly emo geek and his would-be girlfriend who, never mind, get killed off about a half hour into the story because never mind, the story we really want to tell is Mephisto trying to corrupt a little girl’s pure soul by attacking her in her dreams, and finally, in an empty factory. He is aided in this by four witches representing the four elements, and the Four Horsemen of the Apocalypse: Rather Fey Pestilence, Whiney Famine, Mardi Gras Death, and Bad Acting. Luckily the spindly geek managed to discover the power of METAL and bring back Jon Mikl Thor before being written out of the story. 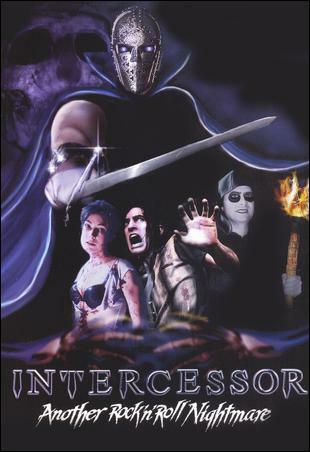 So Intercessor is Rock ‘N’ Roll Nightmare writ large, with that last ten minutes or so expanded to an entire movie. As in the end of that movie, there is absolutely no way the production has the resources to effectively tell the story they want. Somebody’s pretty damned good with Adobe After Effects, and there are occasionally some nice visuals, but the seams are really, really visible; the chaotic story, the villains who need to go to Evil Laugh School (the good guys and the four witches are fair to pretty good, though), and those fights that really want to be Highlander class stuff, but generally consist of a couple of moves and the witches getting defeated by Thor throwing his cape over them. Incidentally, I was rather surprised to find out that Pestilence and Famine can be killed by zombies. Who knew? My suspicion is that each and every member of the cast and crew owned a van with Frazetta’s Death Dealer airbrushed on the side. Intercessor has heart, there is no doubt. What it didn’t have was the budget and actors to pull off its grandiose ambitions. …is the polar opposite. 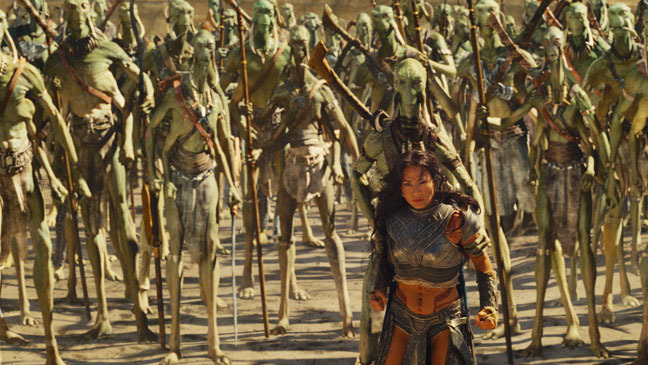 Disney’s multi-kabillion dollar film version of Edgar Rice Burroughs’ John Carter of Mars series has the moolah to make the story work, and in astounding, visually impressive ways. Good God, the fact that I never doubted the reality of the four-armed, green Tharks is a testament to the FX department (although I expected them to be more muscular, influenced by the Frank Frazetta covers to versions I read while a teen. Just to drag ol’ Frank into the discussion again). There were changes made to make the story more palatable to modern audiences, or so the focus groups decreed. Since we no longer cotton to the concept of gentleman swashbucklers, Carter has become a Civil War vet with a dead family to mourn, stopping just short of Josey Wales in Space. Dejah Thoris , the Princess of Mars (hey, he said the name of the book!) has been updated fairly nicely, and the Therns are upgraded to all-purpose, powerful villains who are apparently not even Martian, but an older alien race who are beginning to set their sights on Earth. 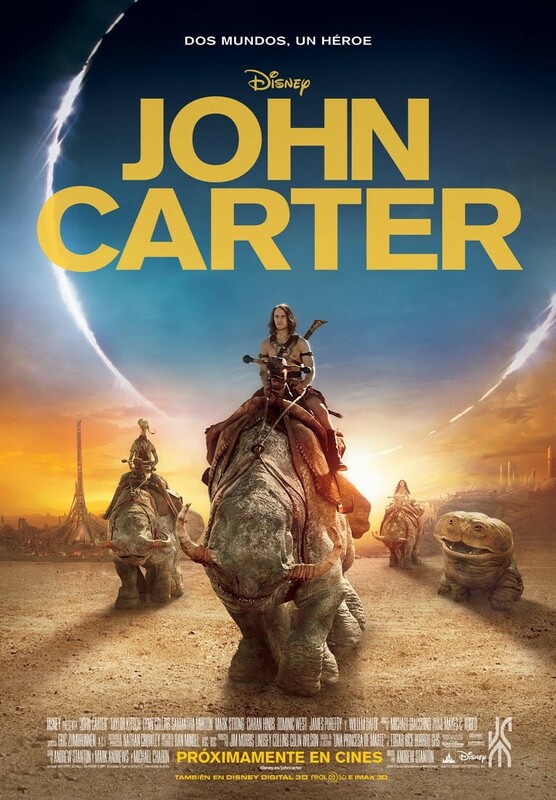 Past that, John Carter successfully carries on the one-damned-thing-after-another structure of the novels, all on a convincing alien world. Taylor Kitsch won me over as Carter, and Lynn Collins is fantastic as Dejah Thoris. A friend of mine contends that Hollywood should stop screwing around and cast Collins as Wonder Woman, and he’s right. Everybody I know who’s seen John Carter enjoyed it, if not outright loved it. So why did this movie die at the box office? Why aren’t we already talking about the sequel? For some reason, Disney seemed to pretty much abandon it; the striking of the words of Mars from the title for purely superstitious reasons (“No movie with Mars in the title has ever been successful!”) is pretty emblematic of the corporate lack of trust in the product. It’s saddening, really. John Carter is pulp entertainment on the same high satisfaction level as The Avengers, but it was just never given a chance. Akira Kurosawa begins the twilight portion of his director’s career. He almost didn’t get there; Red Beard put an end to his relationship with Toshiro Mifune, and left the director with a reputation for difficulty and wastefulness. The failure of Dodes’ka-den in 1970 seemed to put an end to that career. 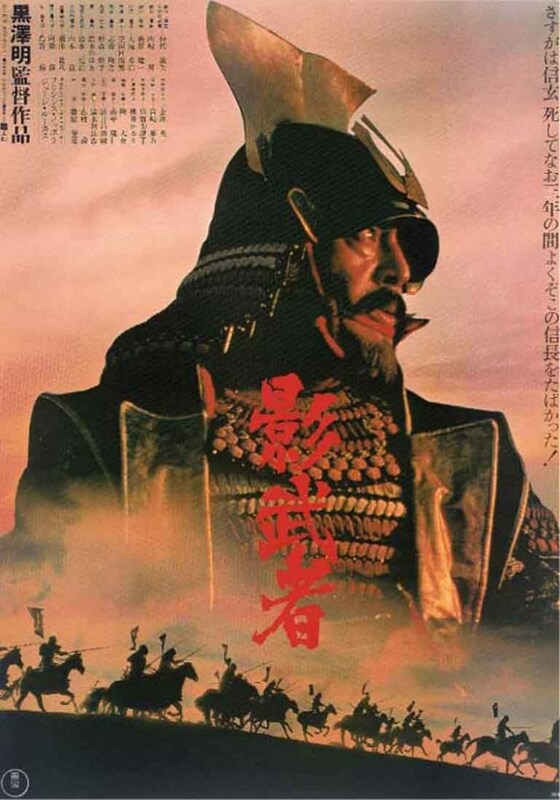 Mosfilm had the good sense to hire him to direct Dersu Uzala in ’75, and that movie receiving an Oscar for Best Foreign Film bolstered him a bit, but Toho was on the financial ropes and no one seemed especially anxious to finance Kurosawa’s next project, a return to the medieval samurai film. Enter a couple of Kurosawa fans named Francis Ford Coppola and George Lucas, who convinced Fox to put up the money in return for distribution rights. Kurosawa spent a lot of that downtime painting, and it is those paintings that form the most beautiful storyboards ever employed. 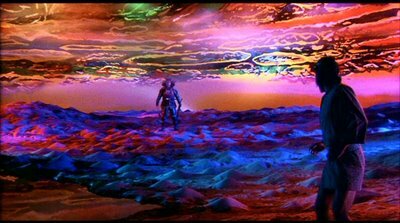 There are times that the lighting in Kagemusha is so lush,so colorful, it is impossible to deny that Kurosawa had successfully transferred his painted image to film. Kagemusha, literally, “shadow warrior” is supposedly based on a true story of the Warring Nations period preceding the Tokugawa Shogunate, when Japan was constantly in a state of battle between various ambitious warlords, roughly the end of the 16th century. When one of the most powerful of them, Lord Shingen (Tatsuya Nakadai) is wounded fatally by a sniper’s bullet, a common thief with an uncanny resemblance to him must take his place to maintain the clan’s position of strength. The thief excels at the deception, his overconfidence eventually, albeit accidentally, revealing the ruse, and the thief watches in horror as Shingen’s ambitious, unfortunately impetuous son wastes his entire army on one ill-conceived attack. The story was at first fairly small, concentrating on the thief, his change of heart and demeanor and the growing relationship between him and Shingen’s grandson, a six year-old who is delighted that his grandfather’s “long illness” has rendered him “no longer scary”. But the scope of the story spun out from there, with the various competing lords trying to figure out what exactly is going on so they can plot their next move with assurance. The deliberate unfolding of the plot and the seeming lack of focus on the title character can wear a viewer down, but that’s also part of the genius of Kurosawa; the thief so thoroughly vanishes into Shingen, we never truly know him, and as Shingen’s brother, who had so often played the role of Shingen’s brother, says, “The shadow of a man can never desert that man. I was my brother’s shadow. Now that I have lost him, it is as though I am nothing.” Indeed, once the thief can no longer wield the power of Shingen’s phantom, the entire clan becomes nothing. 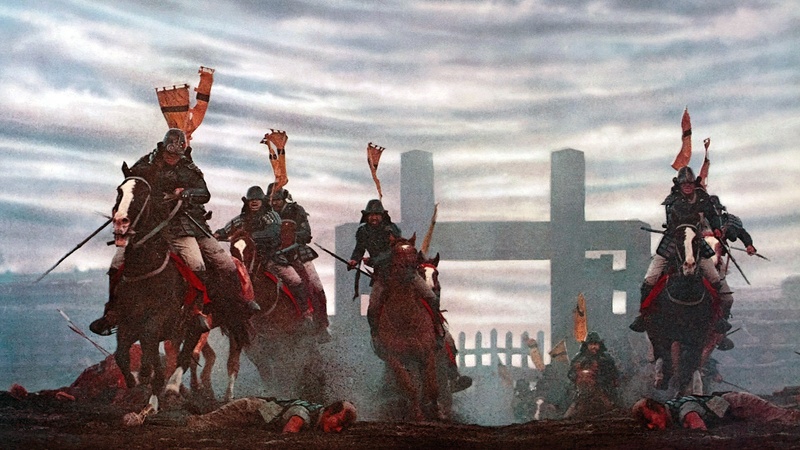 Kagemusha is good – it’s really very hard to go wrong with Kurosawa – but so much of it also seems a dress rehearsal for Ran, it can be easy to put it on another shelf, with less respected works from a master. So we bookend this entry with shot-on-video sequels. The major difference between Intercessor and The Lost Skeleton Returns Again is, although they likely had similar budgets, Larry Blamire got what he wanted out of his. This is the sequel to Blamire’s 2001 The Lost Skeleton of Cadavra, a canny parody of low-budget late 50’s sci-fi programmers. It was the best post-Airplane parody movie, because it didn’t lampoon a specific movie – Lost Skeleton is very much its own movie, using every bad movie trope Blamire had ever seen. 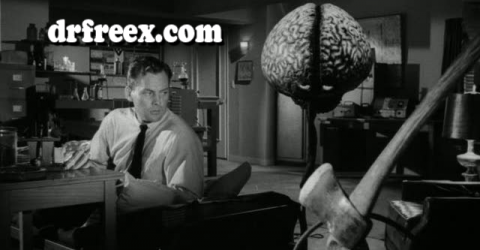 The Ed Wood-style mangled speech patterns, flying saucers (and skeletons) on wires, a monster wearing workboots under its carpet-remnant costume… it was a project that came from love, and it was damned near perfect. I couldn’t wait to see what Blamire would do next. I’m actually still waiting. His immediate follow-up, Meet the Mobsters (2005), I literally only found out about five minutes ago. Trail of the Screaming Forehead (2007) ran into that old bugaboo, troubles with the producer, who at one point reportedly took the film away from Blamire, recut it and shot more special effects scenes. That version has shown up on cable channels, and Blamire’s version remains available only on Region 2 PAL DVD. The same year as Returns Again, Blamire also released Dark and Stormy Night, his “old dark house” parody, replete with wisecracking reporters, ominous, hooded killers and more secret panels than are likely safe for structural integrity. I love Dark and Stormy Night. Returns Again is very much the spiritual brother of Dark and Stormy Night; Blamire still employs some twisted Wood grammar but relies a lot more on twisted wordplay and rapid-fire delivery of non-sequiturs for his humor. 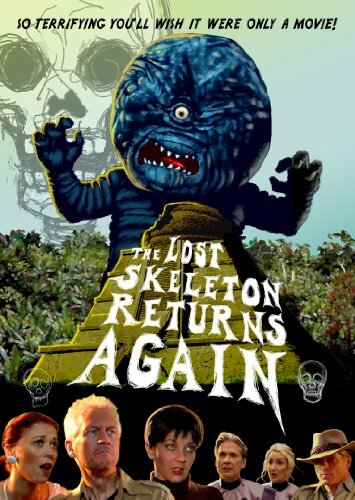 In this outing, the surviving cast from Lost Skeleton all converge on the Amazon, journeying to the Valley of Monsters, ruled over by the Cantaloupe People – both of them. Tagging along are the twin brother of two characters that died in the first movie (how handy!) 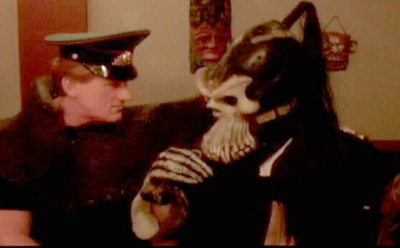 and Blamire, bless him, found a way to bring back Animala, the best character from Lost Skeleton, the woman made of four animals combined by alien technology. Then again, he sort of had to, as she is played by Jennifer Blaire, his wife. Like 98% of all movie sequels, Returns Again isn’t as good as its predecessor, but the fun far outweighs the blah. It’s still an eminently quotable movie, and hell, that’s a goodly portion of what movie geeks care about when they gather together. In my circle, we still pull out the “Have i the message? Have you the message?” bit from Dark and Stormy Night, amusing ourselves and puzzling others.